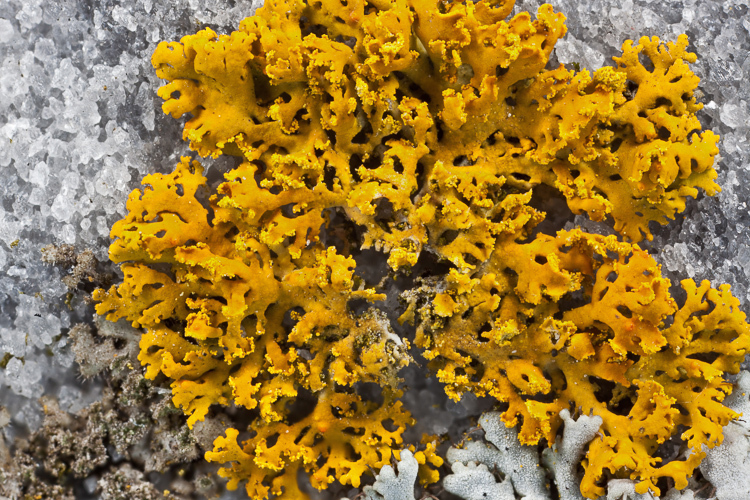 The lichen genus Xanthomendoza (formerly included within Xanthoria) consists of small, yellow to orange (K+ purple), rosette-forming foliose thallus with appressed to ascending lobes. Four species occur in Ohio, of which two quite similar species —X. fallax and X. ulophyllodes –are common and widespread. DIAGNOSTIC FEATURES OF X. fallax: Soredia marginal from cresecent-shaped slits, mostly greenish-yellow in color; compare with X. fulva with soredia produced from beneath the lobe tips, X. ulophyllodes with marginal soredia produced from the lower surface, both with soredia yellow to orange, and with Candelaria concolor with the cortex K- and yellow-green color. ECOLOGY OF X. fallax: This common species is found over much of the US where it prefers non-acidic bark, alkaline rock and cemetery headstones. 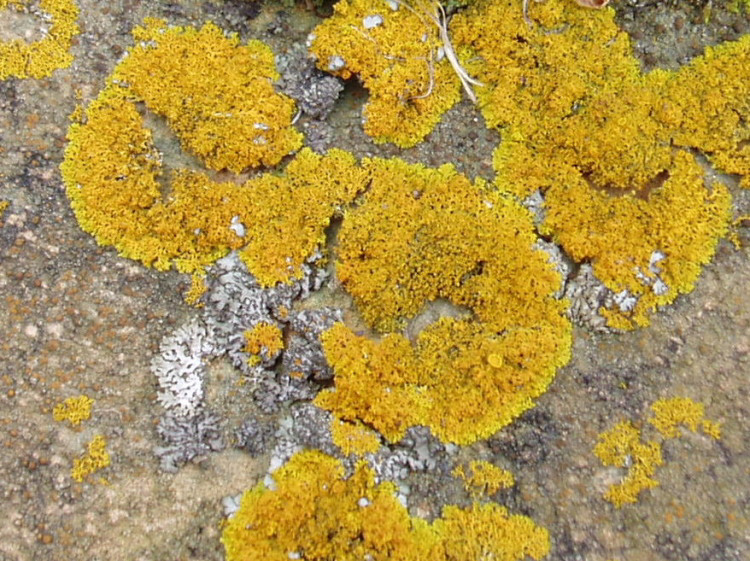 DIAGNOSTIC FEATURES OF X. ulophyllodes: Soredia produced marginally from the lower surface and laminally on older lobes; yellow to orange in color; rhizines frequent; compare with X. fallax with soredia produced marginally from crescent-shaped slits between the upper and lower cortex, greenish yellow in color, with X. fulva bearing soredia produced terminally and marginally from the lower surface, rhizines sparse, and with Candelaria concolor K- and yellow-green color. ECOLOGY OF X. ulophyllodes: This common species is found primarily in the northeastern US; widespread in Ohio but more common in the western portion of the state where it grows on non-acidic bark and sometimes in cemetery headstones.